George W. Brett has been inducted into the Hall of Fame of the United States Stamp Society, formerly the Bureau Issues Association. The Board of Governors voted unanimously to honor the Society’s Chairman Emeritus. Induction into the Hall of Fame is the Society’s highest honor. Brett becomes the ninth person so honored. His contributions to the Society and philately are legendary. In his 67 years of membership, Brett has served on and chaired several committees including plate varieties, possessions and dependencies, Bureau production methods, catalog listings, and publications. He has been a member of the Board of Governors and served as President for two years, Chairman for six years and Chairman Emeritus for 20 years. It is no surprise that George Brett has been known as “Mr. B.I.A.” He has been a prolific writer and contributor to the Society’s monthly journal, The United States Specialist. In the journal’s sixty years index covering the years 1930 through 1990, Brett is cited for authoring a remarkable 540 reports and articles. He is the only three-time winner of the Walter W. Hopkinson Memorial Award for the best article published in The Specialist. He was also the first recipient of the Hugh M. Southgate Distinguished Philatelist Award presented in 1980. The consummate philatelic student, Brett is unquestionably the greatest living authority on United States stamp production. He is also a great teacher willing to share his knowledge and offer suggestions to researchers and writers. Brett has held memberships is several philatelic organizations and has been recognized for his scholarly knowledge. He served for several years as a member of the Postmaster General’s Citizen’s Stamp Advisory Committee. Among his many honors Brett has been awarded the SEPAD National Merit Award and the Phoenix Award. In 1978 he was presented with the American Philatelic Society’s Luff Award. In 1983 Brett received one of the most prestigious awards in philately, The Alfred F. Lichtenstein Award of the Collectors Club. George Brett is much more than “Mr. B.I.A. ;” he is philately’s “Man of the 20th Century.” The Board of Governors is honored to induct George W. Brett into the Hall of Fame. 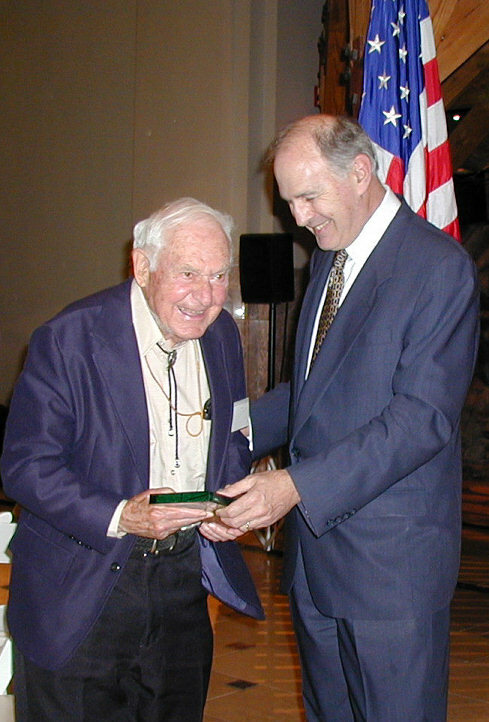 A special citation and award was presented to Brett acknowledging his contribution to philately and induction into the Hall of Fame at the Society’s 70th Anniversary Banquet, June 2, 2000, at the National Postal Museum. 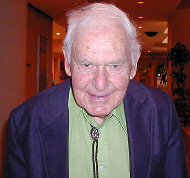 The Board of Governors of the United States Stamp Society is honored to induct into the Hall of Fame, George W. Brett of Spirit Lake, Iowa, who, exemplifying true scholarship and devotion to philatelic research for almost 70 years, has given unstintingly of his time and effort in the service of our organization. George Brett (left) receives his citation for induction in to the United States Stamp Society/Bureau Issues Association Hall of Fame from Chairman Roger Brody. Developed and hosted by Wyzaerd Consulting, Inc.